The U.S. Department of Energy’s (DOE) new legislation governing the energy efficiency of distribution transformers went into effect on January 1, 2016. The end result of this new legislation (DOE 10 CFR P431) was to lower environmental impact and a cost savings derived from decreased energy use. SolaHD supports this change, and the environmental benefits that will result. We know transformers are a key part of the U.S. infrastructure. SolaHD has a long tradition as a high quality, U.S. manufacturer of low voltage general purpose distribution transformers. We are proud to offer transformers manufactured of unsurpassed quality, right here in the United States. 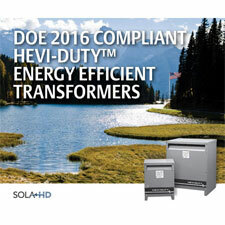 SolaHD’s enclosure sizes did not change for the DOE 2016 energy efficiency transformers. These models fulfill the DOE 2016 requirements utilizing the same form, fit and function of the pervious TP-1 (EPACT 2005) models. Emerson's SDN-C Redundancy (RED) Modules support redundant power supply operation by continually monitoring the condition of two power supplies connected to a single load. The RED modules are certified internationally, for harsh industrial and hazardous environments. The MOSFET design generate less heat than traditional diode-based designs. Diagnostic LEDs assist in balancing the load between the two power supplies. SolaHD, a trusted brand of Emerson, introduces the SDU-A Series of DIN Rail Uninterruptible Power Supplies, bringing higher performance and enhanced communications to industrial power protection. Compact and affordable, the SDU-A helps businesses reduce production losses and maintain maximum production by protecting from damaging impulses and power interruptions. SolaHD has increased the efficiency of their DOE 2016 compliant transformers by reducing core and winding losses. Increasing the efficiency of a transformer allows the unit to operate at the same level of power with less energy being wasted. This significantly reduces the overall impact of distributing and consuming energy which reduces environmental impact. SolaHD’s new SVL Series of DIN rail power supplies are ideal for high volume, controlled environments. Building on SolaHD's impressive three tier DIN Rail AC-DC power supply family, these new units are designed to deliver all the essential advantages of power quality technology in a compact, easy to install design.